Our cars hold a very special place in all of our hearts. No matter how much it costs, how freakishly huge it is or how it gets stuck over speed bumps that you come across. There is no denying that you have put in a lot of effort and dedication to make the purchase possible. So, as a result, you would always want your car to be the best place to travel in. Be it going on road trips with your friends, grocery shopping or even taking your beloved one for a meal outside. Because our cars play such a crucial role in all our lives, it is very crucial that we can sit comfortably in the vehicle at all times. However, you can’t really cruise along the highway without your cabin getting noisy. Now, yes some super luxury executive cars do have pretty good sound deadening systems. But you are very unlikely to own one unless you are a CEO of a multi-billion dollar company. And to make you feel better, no matter how good the sound deadening system might be they won’t really be able to help much. WHERE DO THESE NOISES COME FROM? You have to realize that the car was an excellent invention. And after so many years, it still has to use the combustion engine along with a lot of sophisticated equipment and parts that work together every time you start the car to keep it moving. As a result, it is very normal for you to experience cabin noise while driving. Things get even worse if you have a bigger engine than usual. Because then it will make all the unnecessary grunts and pops. However, if you drive a fully electric carthen you don’t even need to be reading this because your car surely doesn’t make any noise whatsoever and is as clean as a whistle. A lot of noise that enters your car cabin usually comes from the rear wheels. In addition, if your car has a huge and flat trunk area then it gets even worse. It is not just about the sound of your car, but as well as the sound that enters from outside as well. This is road noise. When you are driving your car at more than average speeds, then the whole chassis and body of the car start to make noise as it cannot channel in the air. Thus making talking and listening to your favorite songs in the car nearly impossible. ARE THERE ANY METHODS BY WHICH I CAN PREVENT ALL THESE NOISES? As we mentioned before, the levels of noise your car makes will depend on a lot of different factors. Like it is very normal for bigger cars to make more noise in comparison to small sedans. However, it does not matter what type of car you have. You can always soundproof your car and that too pretty easily and under a cheap budget. And over this article, we will be giving you a step by step instruction on how you can easily soundproof your whole car by yourself. Now, obviously, to soundproof your vehicle you would need to wrap certain areas of your car that makes the most amount of noise. This is where you will be needing some sort of material for wrapping inside your car. Now, we would recommend you use something called FatMat. 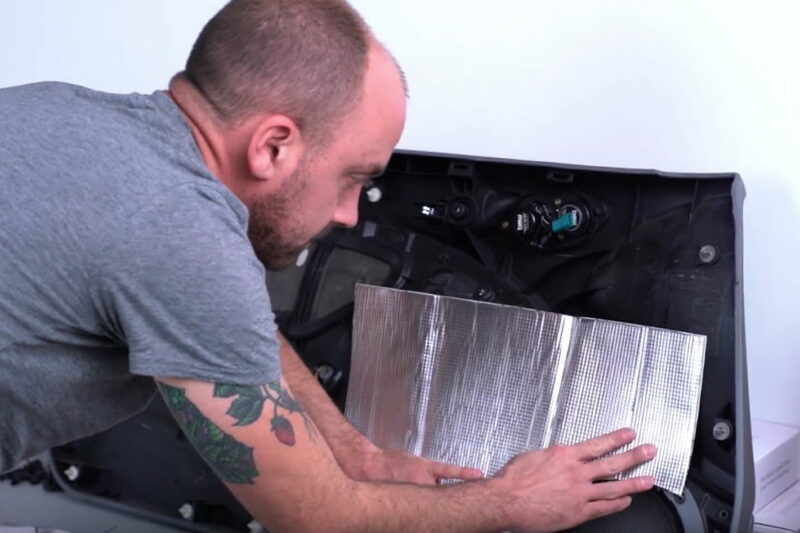 It is a type of sound deadening foam that is super lightweight and once you have applied it to your car we can assure you that you won’t hear any noise whatsoever. WHERE DO I PUT THIS MAT ON? Undoubtedly, the most appropriate place to apply sound deadening is the floor mats of the car. This is because most of the noise that enters your cabin usually comes from the tires. In addition, the floor of your car acts as a base or platform for noise to spread itself throughout the cabin. If you own a big car like an off-roader Jeep or Range Rover that has a flat trunk and double rows of seats. Then it is immensely crucial that you cover these areas as well. As the inability to do so will amplify the noise even more. So the main areas that you will need to keep covered are under the floor mats and also under the back seats of your car. However, if you want to go full on the low key and to the next level of sound deadening then you can also soundproof your car doors as well. But, do keep in mind that it is a bit tricky process and will surely need some effort. HOW DO I USE FatMat? Now, using the FatMat to soundproof your car is pretty easy. 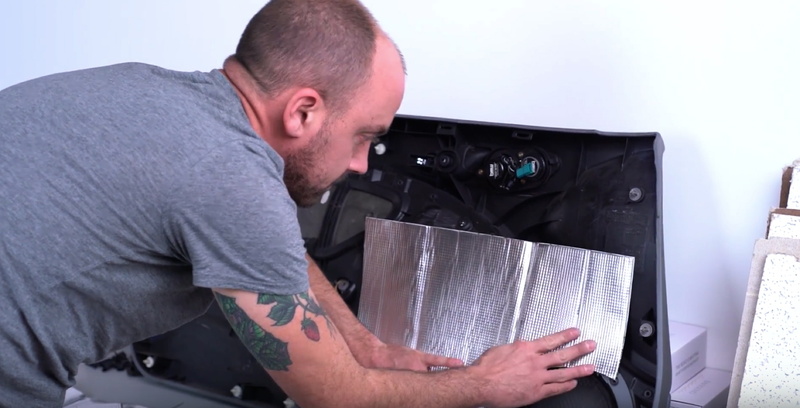 But then again, to make things easier for you we decided to give you a step by step instruction on how to soundproof your car using the FatMat. No matter whether you are using it inside your car or any surface in general. It is very crucial that you clean the surface beforehand. In this case, fully clean the interior of your car. Mainly the area under the mats. This cleaning process is very crucial, because if the surface isn’t clean enough then the mat won’t be able to sit in properly. And as a result, the whole application will come of no use. Now, you will need a utility knife for cutting the mat. Some helpful tools and accessories will come along with the mat. Be sure that you use those. In addition, to the user manual, the roller that comes with the pack is equally important. No matter how good your hands might be, you will still need that roller to make the mat stick perfectly. When you are done applying it just use the roller to give it a final touch. And that shall be it. Now, even though the steps and process that we talked above are pretty simple and basic. It is still very important that you use the maximum required amount of safety while you are at it. Because you never really know what might just end up happening inside your car. Just a simple spark can end up causing severe injuries. So always remember safety first. As we mentioned before, that soundproofing your cars will always be the most ultimate way of preventing sound from entering your car. However, this has certain problems as well. First and foremost, dismantling your car doors and putting them back again can be very confusing. And not everyone may have the required skill to perform it. Many might end up seeking help from a technician. This will eventually increase your bills. You solely cannot undertake this process. And even if you do end up doing it on your own, your car will not drive like before. As it will have weight added where it surely wasn’t functioned to carry. However, we can assure you that after you have used FatMats to soundproof your car, you won’t really need to soundproof your doors at all. Nonetheless, if you want we will write another article explaining the process that you would need to follow to soundproof your car doors as well. Do let us know if you want us to write that. Till then, drive safe, follow traffic at all times and do not let noise ever ruin your beautiful trips and moments.